Editor's Note: The earliest occurrences of this carol that I've found to date are from two Broadsides published in the early 1800s. The earliest publication in book form was the 1847 A Good Christmas Box. I performed a comparison of the lyrics given in these two broadsides with those in A Good Christmas Box, the results of which are printed on this page. Differences in the broadsides from A Good Christmas Box are in a yellow highlighter. From all his sins I’ll set him free. Eternal life to him I'll give. I'll give him everlasting pain. Then beg of God to give it thee. For without faith you can't him see. The wrath of God you cannot miss. Thou'rt sure to have eternal bliss. With joys that cannot be expressed. T. Bloomer, Printer, 53, Edgbaston-street, Birmingham, between 1822 and 1827. Roud Number 210 at the Vaughan Williams Memorial Library (15 records for this title). D. Wrighton, Printer, Snow-Hill, Birmingham between 1811-1813, as per Birmingham Ballad Printers, Part Four: V - W.
8 eight-line verses, with two small illustrations (top and bottom). Title: A Carol For Christmas-Day; first line: This is the truth sent from above. 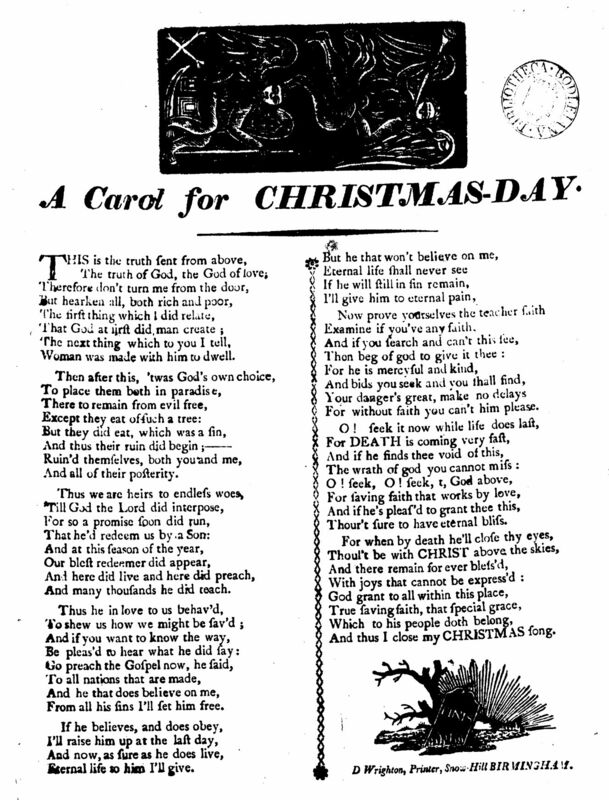 'A Carol for Christmas Day' from D. Wrighton, Printer, Birmingham. Except they eat of such a tree. That he’d redeem us by a Son. I'll give him to eternal pain. For without faith you can't him please. Thour't sure to have eternal bliss. 'The Truth Sent From Above' from T. Bloomer, Printer, Birmingham. I'll give him eternal pain. 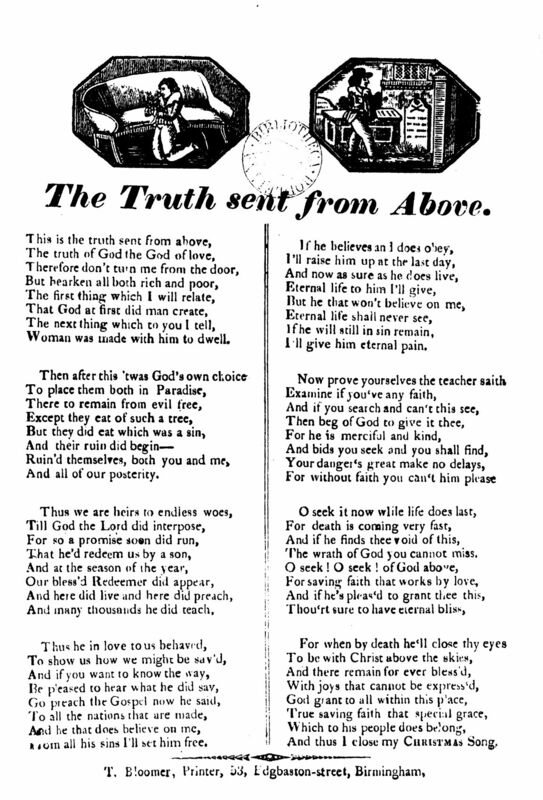 The sixteen verses in A Good Christmas Box (1847) are in this file, The Truth Sent From Above, which also contains the complete notes for this carol. For the version by Cecil J. Sharp from English Folk-Carols (1911), see: The Truth Sent From Above. For the version from Herefordshire printed in the JFSS (1910), and used by R. Vaughan Williams in Eight Traditional English Carols (1919), see: The Truth Sent From Above - R. Vaughan Williams. There is another version, consisting of five verses, which appeared in the Oxford Book of Carols, and was later incorporated into 100 Carols for Choirs. The verses were 1, 2, 5, 6, 7 from A Good Christmas Box. There was an unfortunate juxtaposition of the last line of the second verse and the first line of the third verse (the original fifth verse). See: The Truth from Above - Oxford Book of Carols. For a discussion of similar tunes, see The Truth Sent From Above - JFSS Update.